The Staten Island Economic Development Corporation selected this design by Leitner-Poma to move forward as part of a proposed connection to Manhattan. New York City’s iconic Roosevelt Island Tramway could soon be joined by a gondola linking Staten Island to Bayonne, New Jersey serving commuters and tourists alike. Staten Island has all the ingredients for a successful urban gondola: a dense (and growing) population, a geographic barrier surmountable by cable, and connections to other transit modes at both ends. 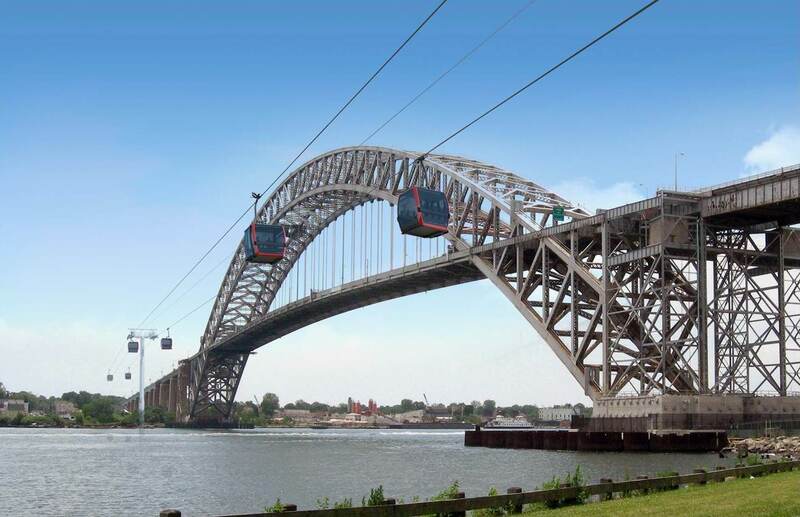 This week, the Staten Island Economic Development Corporation (SIEDC) crowned Leitner-Poma of America the winner of a design competition it launched in January to promote a ropeway solution. A jury of engineers, architects and business leaders selected Leitner-Poma’s 10-passenger gondola proposal that would cross the Kill Van Kull tidal strait to New Jersey. In its request for proposals, the nonprofit development corporation floated four possible alignments for a gondola to serve Staten Island. According to the development group’s request for proposals, subway-less Staten Islanders suffer from some of the longest commutes in the country, averaging 90 minutes to Manhattan by ferry. A new rail tunnel under New York Harbor is estimated to cost $400 million per mile and would not be completed for a generation, if ever. Despite mobility challenges, $1 billion of redevelopment is currently underway in this suburban borough. The SIEDC’s competition encompassed 4-6 possible routes, the most ambitious of which would connect Staten Island’s northeast tip with Battery Park in Manhattan over five miles of water. Leitner-Poma recognized the technical and political challenges of 10,000-foot spans skirting the Statue of Liberty over New York Harbor and instead settled on a shorter connection to New Jersey and its rail network. Other entrants chose routes from Staten Island to Brooklyn, where the East River Skyway is separately proposed to connect to Manhattan. The winning design would depart from the Elm Park neighborhood, paralleling the Bayonne Bridge and terminating at the 8th Street terminus of the Hudson-Bergen light rail line. Starting with six minutes in the air, Manhattan-bound commuters would spend as little as 33 minutes getting to the World Trade Center via the 1.3-mile gondola, light rail and PATH trains. “The Leitner-Poma design was innovative and creates synergy between the West Shore light rail proposal and our ultimate goal to connect Staten Island to the region,” noted SIEDC President and CEO Cesar Claro. “We envision this project to move forward simultaneously with the rail link,” he continued. 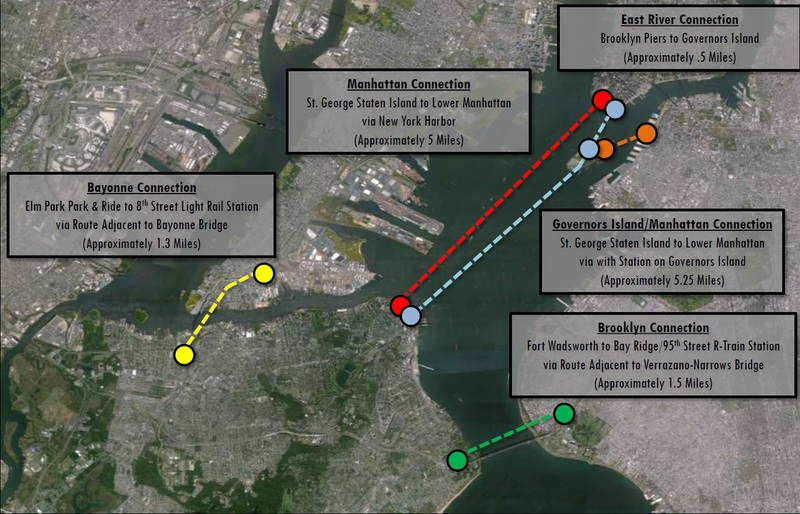 Jurors noted the Bayonne route’s winning combination of modest cost, short ride time and high feasibility. The lift would cost approximately $60 million and be funded privately. Leitner-Poma of America already operates the Roosevelt Island Tramway through a public-private partnership similar to Doppelmayr’s at the Portland Aerial Tram and BART Oakland Airport Connector. While the SIEDC did not release details of other proposals made by other companies, initial letters of support were submitted by Rick Spear of LPOA, Tom Sanford of Doppelmayr USA and the SJC Alliance. SJC is the engineering-consulting firm conducting the feasibility study for the Georgetown-Rosslyn Gondola set to be released this fall. The SIEDC will now raise funds from its members for a formal feasibility study, conduct public outreach and submit the project to the City of New York for review. Mayor Bill de Blasio has expressed openness to the concept in the past, stating “any proposal for how to move people around is worth examination” when asked about a gondola at a June 2015 press conference. While Leitner-Poma certainly gets a leg up by winning the design competition, others will likely be able to bid as part of a future competitive procurement process. In the meantime, congratulations to Leitner-Poma of America for developing a winning concept.